On a cheerful morning during the crunch time before Art Basel Miami Beach, Samuel Borkson and Arturo "Tury" Sandoval -- founders of the resolutely perky artist team FriendsWithYou -- are in their Design District offices/studio/store/playground, putting the finishing touches on their upcoming Rainbow City installation. This mega-project -- their most ambitious to date and a continuation of one they did for the Luminato Festival of Arts and Creativity in Toronto's Queen's Park -- is in essence a free-floating carnival. Think 40-foot-tall inflatable "magical mushrooms," surreal bounce houses that hold countless merrymakers, towering hot dog-shaped balloons with candy-cane stripes and performers strolling around in inflatable costume. The whole experience, according to the FWY manifesto, is meant to "capture the moment of an exploding star." For the partners, working closely with Miamian Pharrell Williams -- the protean being who dominates every aspect of pop life here -- has helped their already chipper mood. Both in their 30s and Miami homeboys, they've been on a roll lately. The benediction of Pharrell has, of course, changed the course of FWY. "He has helped us so much with merchandising, our artwork, the films and branding we want to do," says Borkson. "His dreams are so big, and he under- stands how we want to put our dreams into play." Pharrell has been a long-time fan of their work -- he first met them in 2007--though their collaboration began fairly recently when Pharrell needed an over-the-top car for a music video. Borkson and Sandoval created a groovy-woovy effect on a 1960 Rolls-Royce, wrap- ping the car in their trademark psychedelic colors--sort of middle- period Peter Max meets the American spawn of Takashi Murakami. The way tricked-out car, christened "Magical Explosions," appeared in the video for "Hot-N-Fun" (a track off of N.E.R.D. 's recently-re- leased Nothing) that was shot in the California desert. FWY went on to do other imagery for N.E.R.D., from tour videos to art for the official website: on the site, a somber three-eyed face in black suddenly erupts in a barrage of post-Kenny Scharf iconography, the face pulsating like a nuclear reactor in meltdown mode. Borkson was raised in Plantation, FL, bounced around from high school to high school, and then set to work. Sandoval came from Cuba at 14 and joined forces with Borkson several years later: they began doing toys, then installations, paintings and animations. The FWY aesthetic evolved over time, but throughout they have remained huge fans of Japanese art, Murakami in particular. 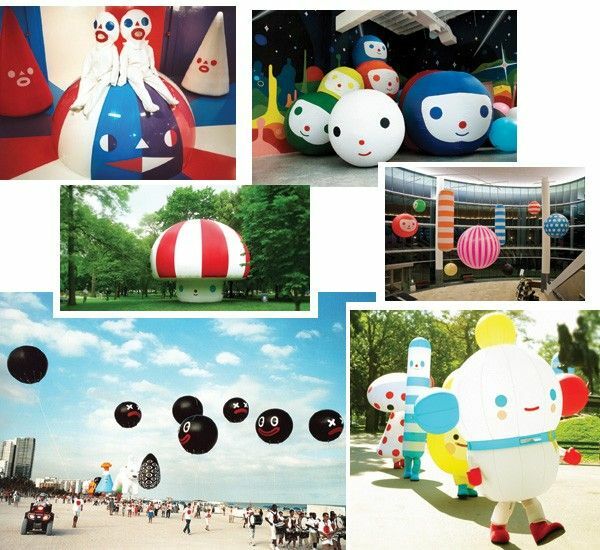 A few years ago, they began doing inflatable creatures: For the 2006 Art Basel Miami Beach, they created a "Skywalkers" blimp parade, and the possibilities for inflatable art continued to unfold. In essence, FriendsWithYou is about the enduring power of whimsy and creating fables: FWY bills themselves as a "portal to a secret club and lifetime adventure." All that whimsy has paid off, from a "Cloud City" installation at MOCA in Miami to the "Garden of Friendship" show at New York's Diesel Denim Gallery. They have also done image branding for Target, Volkswagen and Coca-Cola, along with music videos for Gwen Stefani and Santigold. At the last Art Basel, they opened their studio, gallery and re- tail operation, done up with a FWY neon sign and pale blue walls adorned with jolly clouds and rainbows. In their office, the partners keep a plastic statue of Mickey Mouse: Walt Disney is one of their idols. The store sells, among other things, cuddly plush toys shaped like mischievous cheeseburgers and penguins, and it was quite the scene last year, with Pharrell, Christian Louboutin and Shepard Fairey all stopping by to hang out. This December during Art Basel, they'll be focusing on Rainbow City, an art work that reflects all their influences; like Sandoval's Cuban background (particularly Yoruba, a religion tied to Santeria) and Borkson's Judaism. The installation also has traces of Hindu Holi festivals and Native American ceremonies. To Sandoval, it's all part of the FWY dialectic, an attempt to "incorporate all religions of the world in a playful and not scary way. Our art has a ritual, spiritual aspect, and it's fun, colorful and interac- tive, with many levels of access." And to Borkson, who believes that FWY installations can "cleanse people without them even knowing it," Rainbow City, Pharrell and all the rest is part of the new Miami message: "It's such a different town now--look at the De La Cruz museum down the street. The whole city was missing a groove before, but now it's a magical place, full of art."